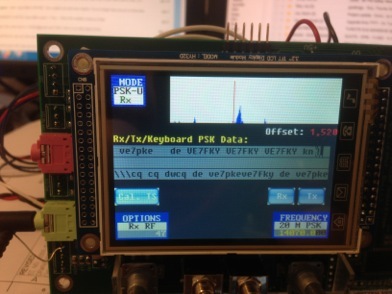 AQRP ....today "Smaller" means more "Function", This is the STM32-SDR in action. The website will be expanded over time. AQRP meetings are held once a month on the second Saturday at Luby's near 183 and 620 in NW Austin (right off 183). since they offer a breakfast buffet which is over at 11AM, it pays to get there before then or you can grab lunch......or just get a cup of coffee. We generally have a pretty good group and someone usually brings some show and tell stuff or items to give away. Things under discussion include (but are not necessarily limited to) tuna tin and Altoids tin projects, antenna tuners, problems with rigs, WSPR contacts, LF activity, Microwave downconverters, keyers built, homebrew keys built, good surplus stuff found, parts sources, soldering techniques, Lo Pass filters, Band Pass Filters, Power supply efficiency, Low Power Amplifiers. Regen receivers, Kits, etc. The common thread is that WE BUILD STUFF (including logical/physical design, programming, source boards, etc. There is a lot of expertise in this group, especially relative to Digital Signal Processing using low power techniques and building the latest DSP rigs like the SDR2GO and STM32-SDR. Programming types are especially welcome for their input. Are you a C++ expert ? ....come on down. Group organization/structure is VERY loose or non-existent, no Roberts Rules of Order, no dues, no officers, no planned programs, no presentations, just a spontaneous gathering once a month of a bunch of hams wanting to promote the hobby. Come and join us if you can. I'm sure we can get John fisher, K5JHF, to get a nice picture of the group for posting.